The following article was published by Eugene Register-Guard on 30 July 1995, some 19 days after the fall of Srebrenica. This news report was located, scanned, re-typed from newspapers and then sent to us by the Bosniak and Jewish Solidarity. Thank you for your contribution. "Rapes of women in Srebrenica: During the clearing of Srebrenica, captured by the Bosnian Serbs on July 11, numerous Muslim [Bosniak] witnesses reported seeing Serb fighters pull young, attractive Muslim women from buses and trucks, execute military-age Muslim men and rob the refugees of whatever scant possessions they saved after the Serbs overran their homes." SARAJEVO, Bosnia-Herzegovina - Bosnian Serb forces have burned houses in the newly captured "safe area" of Zepa, grabbed Muslim men off convoys of people they expelled from the enclave and are claiming to have executed the Bosnian military commander for the region, U.N. officials said Saturday. U.N. spokesman Alexander Ivanko said Ratko Mladic, the Bosnian Serb commander who was indicted last Tuesday on charges of genocide and crimes against humanity, told U.N. officials he had ordered the execution of Avdo Palic, the regional military leader of the mostly [Bosniak] Muslim Bosnian Army. The summary execution reportedly took place after a breakdown in negotiations over the surrender of Muslim [Bosniak] forces still hiding near the town. U.N. officials said they had not seen Palic since Thursday. It was known, however, that the Serbs held him in disdain. 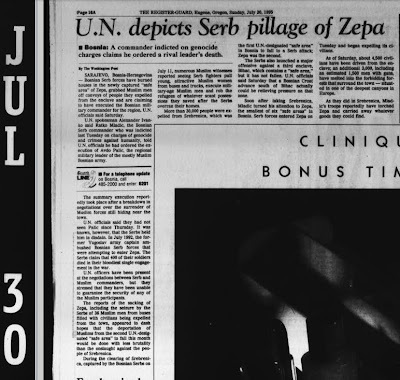 In July 1992, the former Yugoslav army captain ambushed Bosnian Serb forces that were attempting to enter Zepa. The Serbs claim that 40 of their soldiers died in their bloodiest single engagement in the war. U.N. officers have been present at the negotiations between Serb and Muslim [Bosniak] commanders, but they stressed that they have been unable to guarantee the security of any of the Muslim participants. The reports of the sacking of Zepa, including the seizure by the Serbs of 36 Muslim [Bosniak] men from buses filled with civilians being expelled from the town, appeared to dash hopes that the deportation of Muslims from the second U.N.-designated "safe area" to fall this month would be done with less brutality than the onslaught against the people of Srebrenica. During the clearing of Srebrenica, captured by the Bosnian Serbs on July 11, numerous Muslim [Bosniak] witnesses reported seeing Serb fighters pull young, attractive Muslim women from buses and trucks, execute military-age Muslim men and rob the refugees of whatever scant possessions they saved after the Serbs overran their homes. 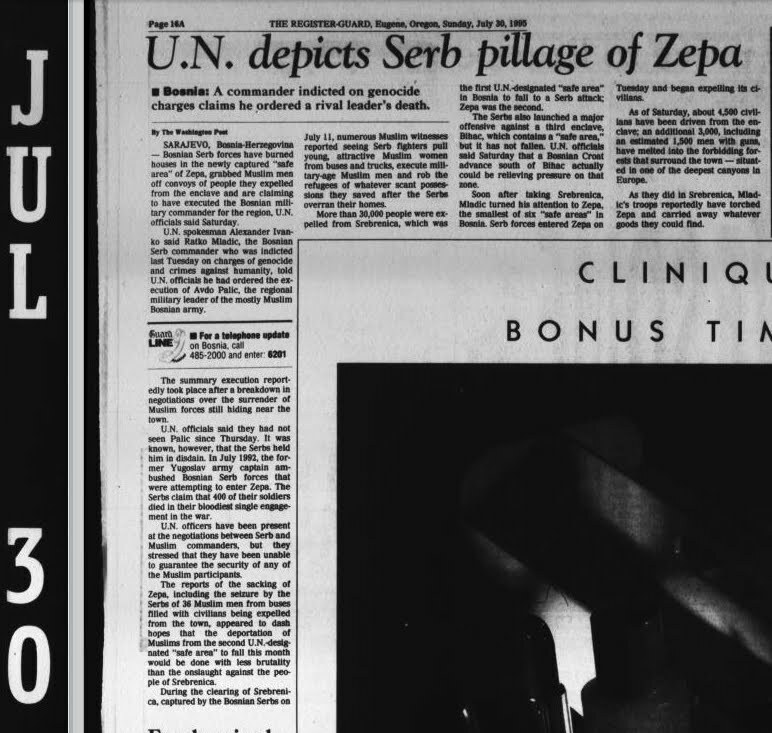 More than 30,000 people were expelled from Srebrenica, which was the first U.N.-designated "safe area" in Bosnia to fall to a Serb attack; Zepa was the second. The Serbs also launched a major offensive against a third enclave, Bihac, which contains a "safe area," but it has not falled. U.N. officials said Saturday that a Bosnian Croat advance south of Bihac actually could be relieving pressure on that zone. Soon after taking Srebrenica, Mladic turned his attention to Zepa, the smallest of six "safe areas" in Bosnia. Serb forces entered Zepa on Tuesday and began expelling its civilians. As of Saturday, about 4,500 civilians have been driven from the enclave; an additional 3,000, including an estimated 1,500 men with guns, have melted into the forbidding forest that surround the town - situated in one of the deepest canyons in Europe. As they did in Srebrenica, Mladic's troops reportedly have torched Zepa and carried away whatever goods they could find.